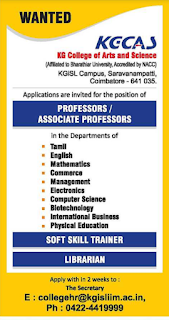 KG College of Arts and Science,Saravanampatti, coimbatore has advertised for the recruitment of Teaching Faculty-Professors,Associate Professors,jobs vacancies. Interested and eligible job aspirants are requested to apply with in 2 weeks. Check out further more details below. 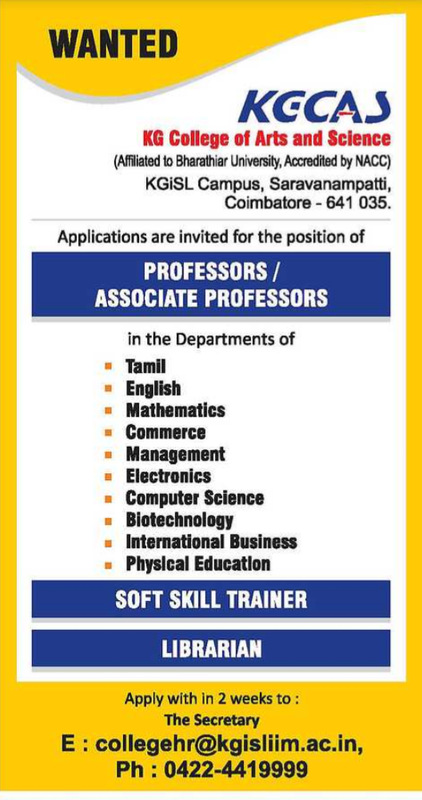 Name of the College: KG College of Arts and Science, Saravanampatti,Coimbatore. About College: KG College of Arts and Science (KGCAS) was started in the year 2005 with the intent to provide quality education at the undergraduate level and post-graduate level, focusing primarily on meeting the talent requirements of the domestic and global IT and IT-enabled service providers. Choosing the right institution for the future will depend on the proximity of such institutions with the industry. KG College of Arts and Science, an Institution sponsored by KG Information Systems Private Limited, is the perfect match to an Industry-Institute learning environment. We call it 'Campus Inside' where learning takes place within the precinct of Industry. Salary Package: As per norms. How to Apply: Interested and Eligible candidates may apply with in 2 weeks.